The railway is part of Rio Tinto conglomerate railway lines, as a tributary to the same destination, were responsible for transporting minerals from the Iberian Pyrite Belt in the province of Huelva, to the port for export. The Rio Tinto's partner characteristics Railways Tharsis, Buitron, Zafra Huelva and other children who had a more or less dense in its headwaters, where were the mining facilities, and the port of Huelva, with facilities for shipment. Our rail, and the various denominations that its parent company has had over the years, is named after the river for many kilometers accompanying their general, which in turn is named after the color of its waters, due to copper sulfides and other dissolved minerals that were deposited in the river bed. The railroad has had a clear British influence from its origins, with the "Rio Tinto Company Limited", and it shows in the merits of its rolling stock, its peculiar gauge, buildings formed around the facility, and even imported habits of the members of its steering apparatus. 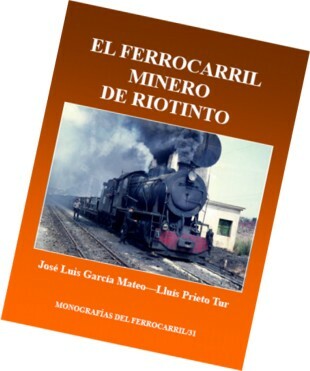 The book describes the administrative changes in the company and the railroad in his complex existence to the state in which the mines, once closed by the depletion of major reefs and operating costs, become complaint tourism in a landscape that the media insist on comparing with the planet Mars. The fans quickly identifies the railroad steam locomotives of the railway by the presence of large digits on the sides of the water tanks. A large motor park, for once had about 150 steam locomotives from very different sources, mainly English, but also from America, Germany and Spain. The railroad had steam locomotives, electric, diesel and compressed air inside the transmission diesel with diesel-hydraulic and diesel-electric and electric, both external power and batteries. All engine and mobile park is detailed throughout the book's pages. Múltipes drawings, tables and photographs complement the text, which also includes the description of general line and branches, industries, railway signaling and safety and the proposed railroad museum today.